The mobile cobots market, which is undergoing the initial stage of its development, is witnessing significant technological advancements at present. In the recent years, there has been a significant rise in the demand for industrial robots in the automotive sector. This can be attributed to increasing customer demand for customization in their cars. Unlike industrial robots, collaborative robots are not dedicated to only a single task. Hence, manufacturers are now switching toward collaborative robots. There has been a significant rise in adoption of mobile cobots over the last few years, due to the wide range of their applications in the automotive industry such as spraying, painting, and assembling of different parts of cars. The market for mobile cobots is projected to reach value of US$ 4,472.53 Mn by 2026 from US$ 336.98 Mn in 2017, registering a CAGR of 33.4% during the forecast period. Furthermore, cobots offer high accuracy in work environments and increase productivity as well as safety. Hence, high accuracy and declining costs are expected to propel the mobile cobots market during the forecast period. The idea of ‘Industry 4.0’ has spread all over the world and currently, it is being implemented at a large scale worldwide. Principles of the ‘Industry 4.0’ design include interoperability, information transparency, technical assistance, and decentralized decisions. Collaborative robots are fully compatible with the principles of ‘Industry 4.0’. Cobots are designed to be equipped with powerful onboard computers. They are interoperable and they can be easily joined to the IoT in any factory environment. In addition, they offer information transparency and technical assistance. They can facilitate decentralized decisions. 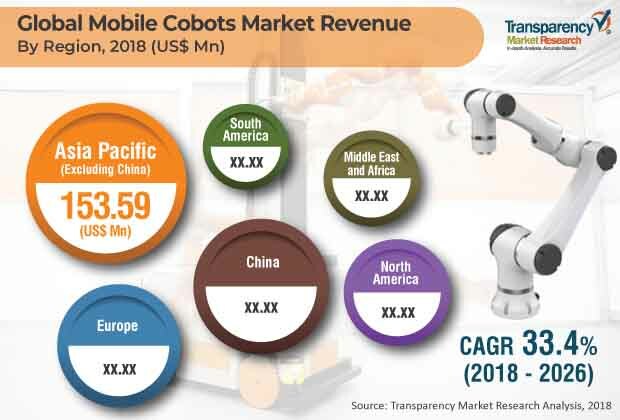 A close study of recent product launches and developments by key participants in the mobile cobots market reveals that end-use industries such as automotive and electronics & semiconductor would continue to dominate the market throughout the forecast period. Applications such as robotic arms, automated pallet forks, and shelf units are expected to witness surge in the demand during the second half of the forecast period. This rise is attributable to further decline in average selling prices of mobile cobots across the world. Force control makes collaborative robots an ideal automation solution for use in the electronics industry, especially when it comes to assembly of delicate printed circuit boards (PCBs) or testing of PCBs for quality control. Collaborative robots are unique due to their high-resolution force control, which enables precise and controllable use of force in handling electronic assemblies, fragile components, and high-quality accessories. On the other hand, cobots provide limited payload and reach. The maximum payload of cobots is up to 10 kg. Cobots can automate processes and tasks weighing up to 10 kg within a reach radius of 1300 mm. These challenges in terms of integration and distribution of existing technologies present opportunities for the mobile cobots market. Multiple market players are shifting toward collaborative robots in order to achieve maximum returns of investment (RoI). This is likely to have a positive impact on the global mobile cobots market during the forecast period. Attracted by the rapidly expanding market and underlying latent demand, several market players are investing in the market for mobile cobots. Manufacturers of products ranging from sensors to accessories and companies across various industries are striving to strengthen their foothold in the mobile cobots market. Some of the prominent players operating in the mobile cobots market and profiled in the study –are ABB Ltd, Aubo Robotics, Fanuc Corporation, Kawasaki Heavy Industries, Ltd., KuKa Ag, Precise Automation, Inc., Rethink Robotics, Robert Bosch, TECHMAN Robots, Universal Robots, and Yasakawa Electric Corporation. These companies are focusing on expanding their business through strategic acquisitions and partnerships. This comprehensive report by Transparency Market Research analyzes and forecasts the mobile cobots market at the global and regional levels. The report provides analysis of the market for the period from 2016 to 2026, wherein 2018–2026 is the forecast period and 2017 is the base year. An in-depth and unbiased market assessment has been made to provide readers with in-depth and accurate analysis. The report emphasizes all major trends anticipated in the mobile cobots market from 2018 to 2026. It also focuses on market drivers, restraining factors, and opportunities for the global mobile cobots market. The study provides a complete perspective about growth of the mobile cobots market, in terms of value (in US$ Mn), across various geographies including North America, Europe, Asia Pacific Excl. China (APEC), China, Middle East & Africa (MEA), and South America. The report includes detailed value chain analysis, which provides an extensive view of the global mobile cobots market. The Porter’s Five Forces analysis provided in the report helps understand the competition scenario in the market. The study incorporates market attractiveness analysis, wherein weight capacity, application, and end-use industry segments have been benchmarked based on their market size, growth rate, and attractiveness. In order to offer complete analysis of the competition scenario in the mobile cobots market, attractiveness analysis of the market in every region has been provided in the report. The market overview chapter explains market trends and dynamics that include drivers, restraining factors, and the current and future opportunities for the mobile cobots market. Market outlook analysis has also been provided in the report. Additionally, the report provides analysis of different business strategies being adopted by leading players operating in the global mobile cobots market. The market introduction chapter helps in gaining an idea of different trends prevalent in the global mobile cobots market. The study provides a decisive view on the global mobile cobots market, by segmenting the market in terms of weight capacity, application, and end-use industry. The report provides a detailed, region-wise segmentation of the mobile cobots market and sub-categorizes it into various countries, thereby providing valuable insights at micro and macro levels. The report further highlights the competition scenario in the mobile cobots market, thereby ranking all major players according to their geographic presence and key recent developments. Insights for the mobile cobots market is a result of extensive primary interviews, secondary research, and in-house expert panel reviews. Market estimates have been analyzed by considering the impact of different economic, political, social, legal, and technological factors. The mobile cobots market in North America has been segmented into Canada, the U.S., and Mexico. Furthermore, the Europe market has been divided into France, Germany, the U.K., and Rest of Europe. The mobile cobots market in Asia Pacific has been classified into Oceania, Japan, India, and Rest of Asia Pacific. Middle East & Africa comprises GCC, South Africa, and Rest of Middle East & Africa. Similarly, South America includes Brazil and Rest of South America. The report provides all strategic information required to understand the global mobile cobots market. The report also offers insights into different segments of the market in various geographical regions mentioned above. The research methodology is a perfect combination of primary research, secondary research, and expert panel reviews. Secondary research sources include annual reports, company websites, SEC filings and investor presentations, national government documents, internal and external proprietary databases, statistical databases, relevant patent and regulatory databases, market reports, government publications, and statistical databases. Primary research involves telephonic interviews, e-mail interactions, and face-to-face interviews for detailed and unbiased review of the mobile cobots market across geographies. Primary interviews are usually conducted on an ongoing basis with market experts and participants in order to obtain latest market insights and validate the existing data and analysis. Primary interviews offer new information on important factors such as market trends, market size, competition landscape, and growth trends. These factors help validate and strengthen secondary research findings. Moreover, the data collected from secondary and primary research is discussed and examined by TMR’s expert panel. The research study includes profiles of leading companies operating in the global mobile cobots market. Market players have been profiled in terms of attributes such as company overview, financial overview, business strategies, and recent developments. Key players profiled in the report are ABB Ltd, Aubo Robotics, Fanuc Corporation, Kawasaki Heavy Industries, Ltd., KuKa Ag, Precise Automation, Inc., Rethink Robotics, Robert Bosch, TECHMAN Robots, Universal Robots, and Yasakawa Electric Corporation. Companies are focusing on expanding their business through strategic acquisitions and partnerships.